I'm excited to be able to share a little project that I've made for the PaperTrey Ink release tomorrow! Boxes, Tags, and Bags, combined with Favor It Weddings, Wedding Day, and Simple Alphabet are the stamps that I used on this small wedding favor tin (PTI large hinged tin). I began by tracing three times around the outside of the lid onto the back side of one of the papers from the new PTI Pink Patterns Collection. This gave me my top and my inside top and bottom pieces. (I had to trim a tiny bit more from the inside pieces.) I used Tombo Mono Multi glue to attach these papers, but you could use any good adhesive. After getting the cover paper in place, I used a length of Berry Sorbet Twill to cover the bottom edge of the tin. (Red-line/Super Sticky tape works beautifully for this.) The top edge was a bit narrow for ribbon, so I cut a narrow strip from the striped paper and wrapped it around the lid top, also attaching it with Super-Sticky tape. Next I changed some photos to black and white, added back a hint of warmth, and printed them on matte photo paper with my inkjet printer. I used my Spellbinders Nestability Scalloped and Plain Petite Ovals and Classic Rectangles to cut and emboss both photos and both mats. Mats are cut from Berry Sorbet cardstock. I stamped flowers from the Boxes, Bags, and Tags set to enhance the cover, mounting them on foam tape and adding a Swarovski Crystal in the center of the flower. The Love Notes tag on the front of the tin is from Favor It Weddings--I adore tiny tags, and I can't wait to see what other "Favor It" mini sets will be coming out in the next few months! 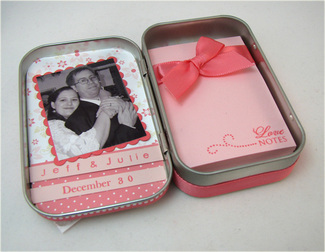 On the inside of the tin, I used the new Simple Alphabet to stamp names, and the Wedding Day set to stamp the wedding date on strips of Sweet Blush cardstock. I found some off-brand pink sticky notes in a 3" x 3" pad and used my Carl Cutter to trim them down on one side to fit my tin. This required pulling the sticky notes into three sections and realigning them. (If you were making these for wedding favors, I would strongly suggest that you go to a local print shop with a stack of them and have them make that cut!) Next I stamped "Love Notes" from Favor It Weddings and the swirl from the Boxes, Bags, and Tags set on each of the sticky notes. It doesn't take that long since you can put both pieces on one acrylic block. I tied the notepad up with some Berry Sorbet Satin, finishing the inside of my tin. 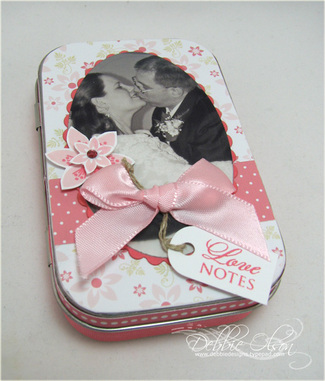 Since the bottom of the tin is covered with patterned paper, and the sticky notes are not secured with adhesive, the notepad can be replaced if it is used up. Granted, these would take longer than some wedding favors, but you might consider doing them for the wedding party and using them as favors at a rehearsal dinner. I hope that you have enjoyed this sneak peek Don't forget to check Nichole's blog for more exciting news! Midnight tonight begins the BIG DAY at PaperTrey Ink. . .